An educational short for anyone who missed (or misses) the Cold War. May actually contain some facts. It definitely contains some little cartoons. Sputnik stars veteran Bay Area comedian Michael Meehan. The first ever Bodega Bay International Short Film Festival included a screening of SPUTNIK. A fun event at a cool venue, the UCD Bodega Marine Laboratory. SPUTNIK is among the short films playing as part of the continuing Shadowbox Cinema series. This time in Houston, Texas, at a cool venue called The Aurora Picture Show. L’chaim! SPUTNIK played the Icon Science Fiction Film Festival in Tel Aviv, Israel. Sci-fi fans across the pond got a chance to see SPUTNIK when it played in Pecs, Hungary at the PLAN9 Science Fiction Film Festival, and in the UK at Sci-Fi London. SPUTNIK screened in my hometown at the Sonoma International Film Festival in Sonoma, CA. SPUTNIK had two screenings at Cinequest in San Jose, CA, and a couple more at the Lake County Film Festival in Illinois. 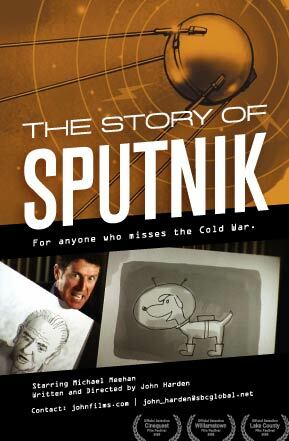 SPUTNIK has a world premiere at the Williamstown Film Festival in Massachusetts. And a lovely time it was. The screening was well attended and everyone laughed in the right places. Williamstown was very nice and the fall colors were spectacular. Every local we talked to said “you shoulda been here last week” but it looked just fine to me. Pictures of the trip can be seen here. SPUTNIK edit completed, but for a final sound mix and color correction. The first festival submissions are going out in the mail this week. That’s a wrap! Many thanks to my fantastic cast and crew. You guys rock, and thoroughly. On location in the Forum Room at the Santa Rosa Public Library.